We are professional in making aluminum foil container making machine and mold for almost 17 years. Our machines have exported to many overseas countries, and have good reputation. We have difference capacity aluminium foil container machine, like 45 tons aluminum foil container machine,63 tons aluminum foil container machine,80 tons aluminum foil container machine, 100 tons aluminum foil container machine. And we also could make different molds for various aluminum foil food containers, foil trays, foil bowl etc…The aluminum foil container mold could be one cavity, two cavity and three cavity based on the size of the aluminum foil container. We could also advice the foil factory to you if you need. We can provide the suitable solution of machine and mold as per your requirement details. a. This aluminum foil container making machine work automatically. c. We can make the aluminum foil container product different foil containers just changing the mold. Like 450ml aluminum foil containers,750ml aluminum foil containers. a. 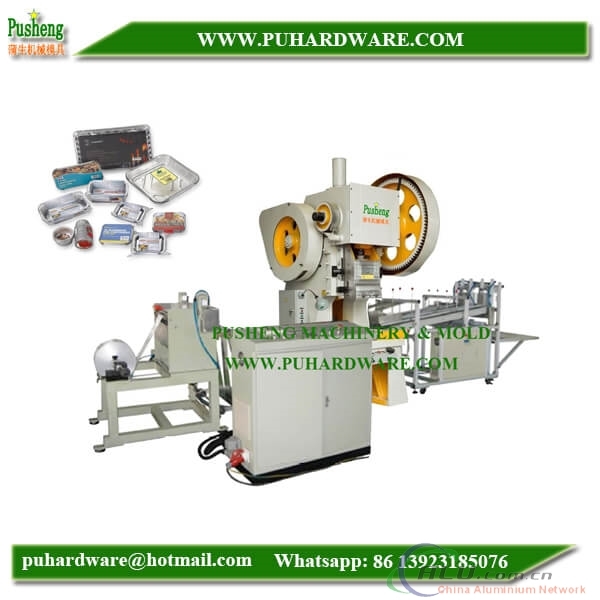 Years of experience----Pusheng Machinery have 17 years experience on the aluminum foil container machines and mold. b. Performance----Pusheng Machinery use high quality machines to guarantee the aluminum foil container quality. And it can use 10 years or longer.